Castor oil has been used for centuries for many health conditions. If it did not provide any health benefits, it would not still be recommended. In terms of fibroid natural treatment, castor oil packs for fibroids are one of the most popular home remedies for uterine fibroids treatment. Why Castor Oil Packs For Fibroids? 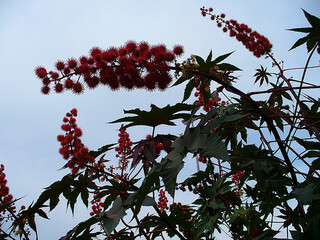 Castor oil is obtained from the castor bean – Ricinus communis – see image on the left of the plant and beans. Castor oil is a triglyceride with the most common fatty acid found in the oil being ricinoleic acid. Ricinoleic acid is thought to be the reason for the reported health benefits of castor oil. It should be noted that there isn’t much scientific research to support the use of castor oil as a health remedy. The positive testimonials are mostly anecdotal. The natural healer Egdar Cayce who died in the ’40s spearheaded the use of castor oil and in particular castor oil packs for the treatment of various health conditions such as constipation (taken orally or through the use of castor oil packs), stimulating the immune system, epilepsy, arthritis, multiple sclerosis, gynecological issues, etc . Castor oil as previously mentioned is thought to benefit the immune system through oral or topical application of the oil. Castor oil packs when used properly can help to improve various components of the immune system. Castor oil packs have been shown in a few studies to increase the lymphocytes which are the disease fighting cells in the immune system. Lymphocytes help the body eliminate disease causing toxins as well as the body’s waste. When this part of the immune system is not working properly, it causes a build up pf these toxins and waste leading to inflammation which can increase the risk of developing various diseases and conditions. Many holistic practitioners believe that fibroid tumors are the result of toxins that the body does not know how to properly eliminate and by increasing the amount of lymphocytes, more disease-causing toxins can be eradicated. Since fibroids are tumors, improving the functioning of the immune system through the use of castor oil packs and the ricinoleic acid in castor oil which has anti-inflammatory properties is thought to shrink the tumors. Castor oil has a very unique ability in that it is able to penetrate the skin in order to relax smooth muscle. This unique ability enables it penetrate the blood and lymph vessels, the uterus, fallopian tubes, ovaries, bowels, gall bladder, liver, etc, in order to correct any issues and improve performance. A castor oil pack is placed on the skin in order to increase circulation and promote elimination as well as healing of the various tissues and organs that lie underneath the skin. This pack can be used many times to stimulate the liver, reduce inflammation, relieve pain, increase lymphatic circulation, as well as improve digestion. Castor oil packs can help to increase the efficiency of circulation in the pelvic region. Good circulation in this region will ensure that supportive nutrients are delivered promptly to the cells, and that waste products and inflammatory factors are eliminated before they can cause damage. When you also place a castor oil pack over your liver area, it can help improve the performance of your liver which is a major waste removal organ. When your liver is functioning at optimal levels, waste, toxins as well as excessive hormones (estrogen) will be eliminated in a timely manner which can help to prevent an estrogen dominant state which is many times blamed for the development of fibroids and worsening of symptoms. What do you have to lose by using castor oil packs if you are tormented by uterine fibroids? What is a Castor Oil Pack? Castor oil packs are popular because they allow the healing properties of castor oil to be absorbed directly through the skin. You can apply castor oil directly on the skin without using a castor oil pack by simply rubbing some of the oil over the affected area of the skin but castor oil packs are thought to work even better. 1. 100% Organic cold pressed castor oil. Organic cold pressed castor oil is free of pesticides or other toxins and is best for use for fibroid natural treatment. 2. Heating pad or hot water bottle. The heat is thought to help the healing properties of castor oil penetrate the body more efficiently. 3. Plastic wrap or even garbage bags. 4. Cotton flannel or pieces of wool large enough to use over the abdomen. 1. Perform a patch test to ensure that you have no allergic reaction to castor oil. 2. Fold the flannel or wool in thirds or use three separate pieces. 3. Soak the flannel or wool in enough castor oil but the flannel or wool should not drip of oil. 4. Lie down in a supine position (face up) with your feet elevated with a pillow underneath your knees and feet. 5. Place the flannel over the affected area. 6. Cover with the plastic wrap. 7. Place the heating pad or hot water bottle on top of the plastic wrap. 8. In order to insulate the heat, you may want to cover the pad or bottle with the old towel or t-shirt. 9. Leave on for 45 to 60 minutes. Use this time to relax, meditate, visualize, etc. 10. Remove the pack and wash the oil off your skin with soap and water or a baking soda solution. 11. You can reuse this castor oil pack many times by storing the pack in a zip-lock bag and keeping it by your bedside or in a cupboard and reusing as needed. Discard when the pack starts to change color or smell. 12. Use the pack for four days consecutively each week for up to a month and rest for the rest of the week. After a month, evaluate the effectiveness or ineffectiveness of the castor oil pack. 1.Castor oil packs are messy so wear old clothes or lie on old clothes that you keep separate from your other clothes because castor oil can stain. 2. There isn’t any conclusive guidance on how long you should use the pack for in order to obtain relief but a month is a reasonable time to evaluate the effectiveness or ineffectiveness of this holistic healing method and decide whether to continue treatment or whether to stop. 3. If you are trying to get pregnant, castor oil packs are not recommended as the heat used may interfere with your ability to get pregnant. 4. If you are on your menstrual cycle, avoid using castor oil packs. 5. Try to avoid a lot of activity after applying a castor oil pack which is why it is best to do this before going to bed. Castor oil packs for fibroids are definitely recommended to be tried by those looking for an effective fibroid natural treatment method. While castor oil packs for fibroids have shown many positive results in many patients, it is important to remember that what may work for one may not work for another and vice versa. For more of the best natural treatments for fibroids besides using castor oil packs for uterine fibroids, you must get your hands on the Fibroids Miracle guide. This holistic guide uses natural methods only and can help you not only eliminate but also prevent fibroids from developing ever again. Find out more about this scientifically proven holistic guide here. Read the safety precautions section of the article. I’ve been using the pack but have developed what looks like brusing on my lower abdomen. Is this a side effect? None that I’ve heard of unless it’s a burn but it doesn’t sound like it. If you haven’t already, stop using the pack and see what happens to the bruise and if any other effects occur.